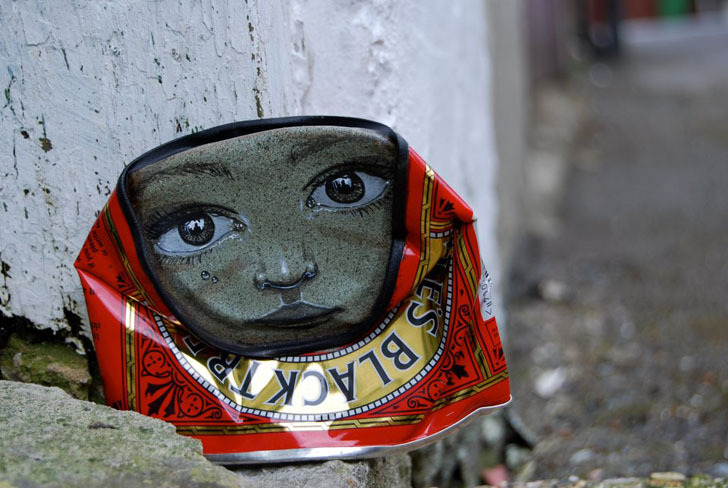 UK-based street artist <a href="http://www.mydogsighs.co.uk" target="_blank">My Dog Sighs'</a> brand of <a href="https://inhabitat.com/artist-ruganzu-tusingwire-transforms-thousands-of-plastic-bottles-into-a-recycled-amusement-park-for-ugandan-kids/" target="_blank">recycled art</a> is really for the people; the British artist transforms used tin cans into small sculptures, painting faces on the bases of the discarded objects. The artist then leaves the <a href="https://inhabitat.com/ernest-zacharevic-makes-playful-street-art-in-malaysia-with-an-old-bicycle/" target="_blank">pieces on the street</a>, for unsuspecting passersby to discover on their own and take home. 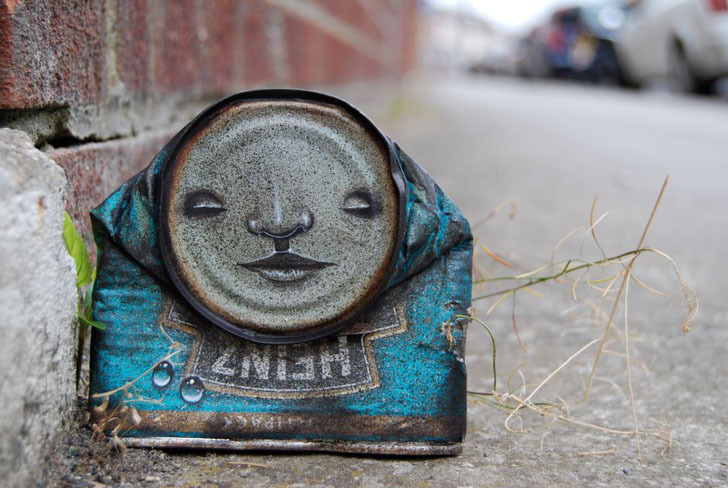 My Dog Sighs begins by <a href="https://inhabitat.com/john-mengs-beautiful-lamps-are-made-with-upcycled-wine-bottles/" target="_blank">upcycling</a> the can into a usable painting surface, crushing the metal so that the can’s bottom is flattened out. 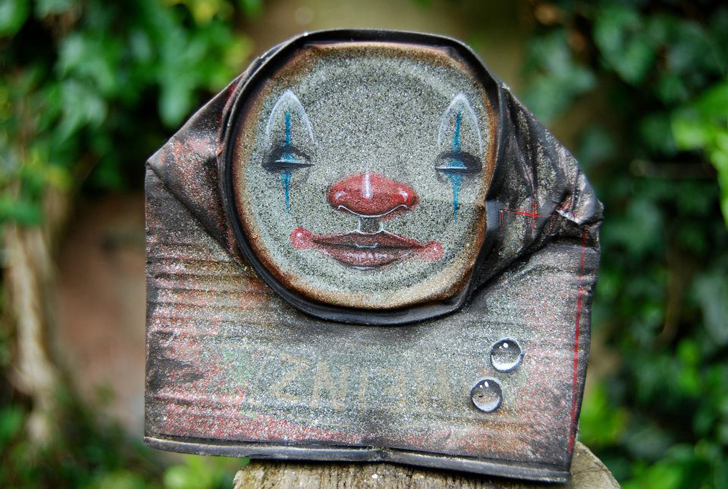 The flat bottom then dictates the shape of the delicate faces he paints on them. 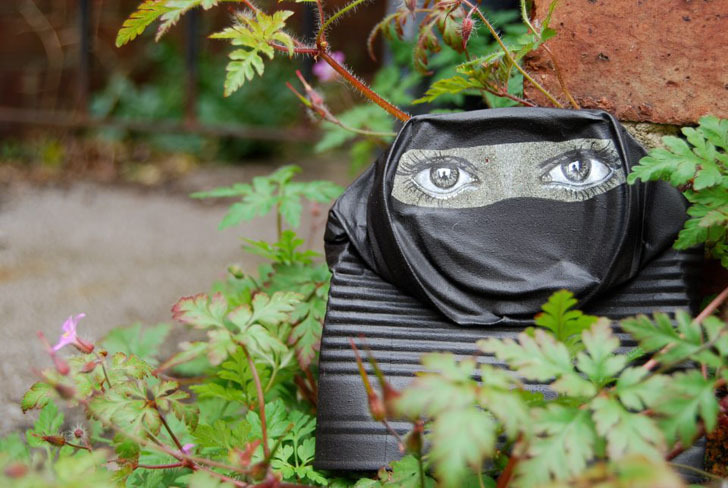 Toothless old women, mustachioed gentlemen, pretty ladies and <a href="https://inhabitat.com/aga-khan-awards-restoration-projects-in-yemen/" target="_blank">Muslim women in burqas</a> represent the myriad of people and immigrants living in his home country of the United Kingdom. 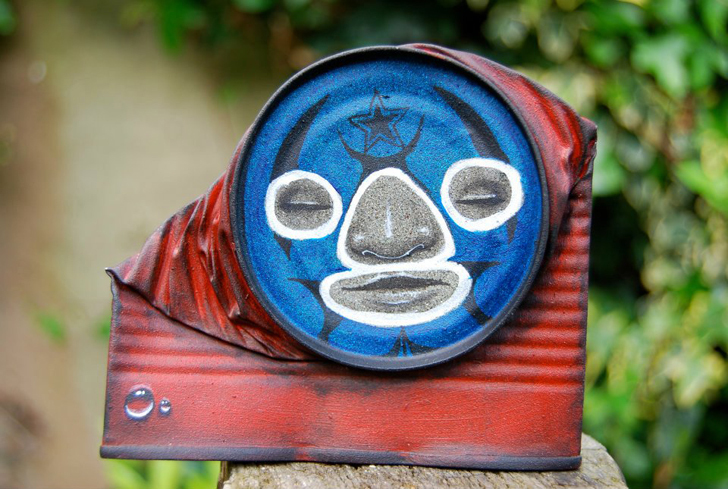 The corrugated <a href="https://inhabitat.com/interview-we-talk-to-artist-benjamin-jones-about-his-incredible-sustainable-treehouse/" target="_blank">surface of the can</a> is transformed into the character’s body, sometimes spray painted, or left as it was. 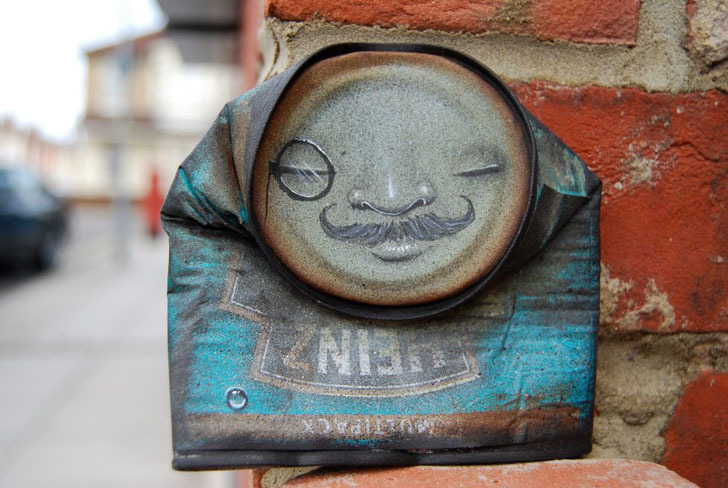 The colorful patterns of the surface become clothing, but also show the viewer the can’s former use. 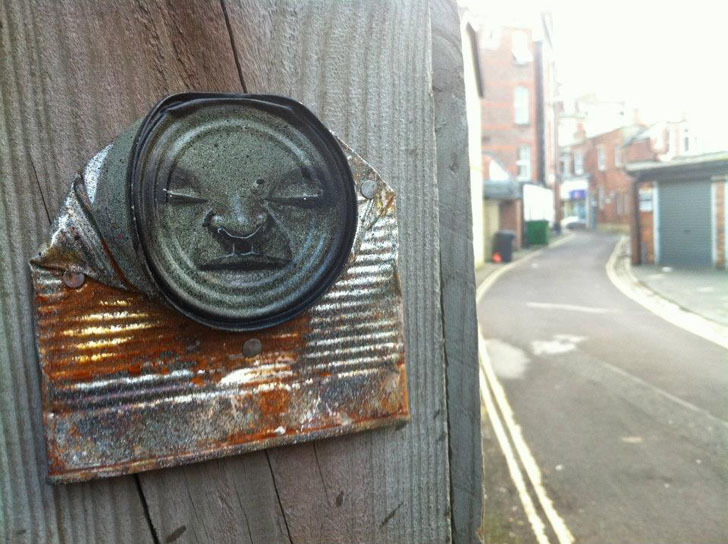 The artist then places the <a href="https://inhabitat.com/tal-avitzur-recycles-vintage-metal-machinery-into-cool-robots/" target="_blank">recycled cans</a> in various scenarios and backdrops around the city for people to find. Called Free Art Friday, the cans are hidden and in plain view, for people to take and make their own. The concept of Free Art Friday has since spread to other corners of the world, encouraging artists all around to <a href="https://inhabitat.com/paige-smith-paper-geodes-add-sparkle-to-nondescript-los-angeles-buildings/" target="_blank">turn their streets into a free art show</a>, creating smiles from town to town around the globe.